This how-to guide will tell you how to set up your profile, navigate OK In The Know, and answer frequently asked questions (FAQ). Search this page! Click “Open All” and then type Control+F to search for words or phrases within this page. 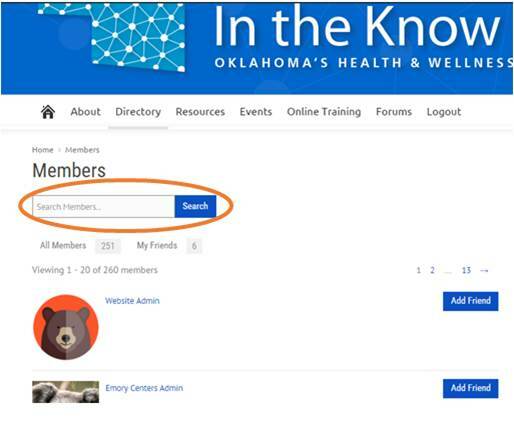 Join our online community to get access to members-only features and connect with public health colleagues throughout Oklahoma. 1. Fill out the “Create an Account” form with some basic information about yourself and click the “Complete Sign Up” button to submit the form. 2. Once the form is submitted, an “activation” email will then be sent to you. Check your spam folder to make sure you do not miss it! When you receive the “activation” email, click the link to verify your email address and complete your membership request. Note: You can now log into the site using your username and password, but please note that several features will not be available to you until your membership is approved by the community managers. Our community managers will review your request to join the community, typically within 1-2 business days. If approved, you will receive an email with instructions on how to log in and activate your account. It’s important to fill out your member profile and upload a profile photo to give yourself a “face” on the site so that your colleagues and prospective public health collaborators can easily find you. Click your username at the top right of the screen to view your personal dashboard. From there view and edit your profile. 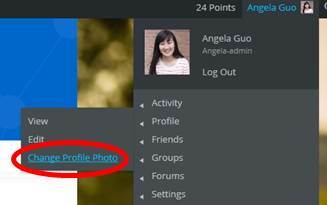 You can upload and edit your profile picture from your personal dashboard. You can then select the photo you would like to upload. Once you’ve selected your photo you will be asked to crop the photo. See the image below. The image within dashed-line box will become your profile picture. You can change the size of the box by clicking and dragging the corners. 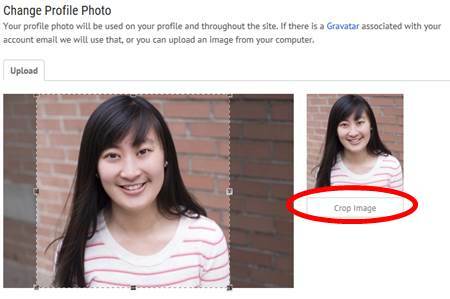 Once you have finished your selection, click “Crop Image” and your profile picture will be uploaded. You may need to logout and login to see the changes on your profile. 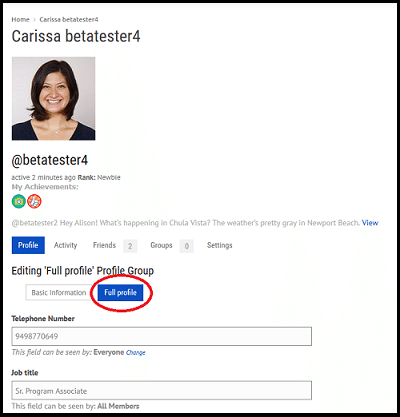 Edit your profile information. Here, you can edit the basic information you provided when you registered for the site. Click “full profile” to fill in your location, areas of expertise, hometown, and hobbies for a personal touch. Get around the site quickly and easily using the main navigation bar at the top of the page. 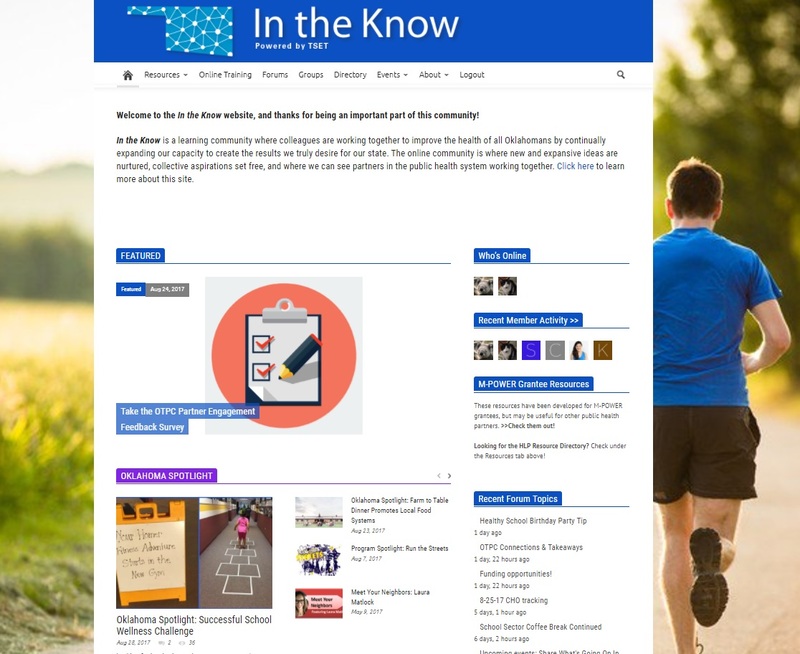 Resources: Find the latest public health research and resources related to building healthier communities, including coalition building, policy, communication, tobacco, substance abuse and mental health. Online Training: (members-only) Visit the In the Know Learning Management System (LMS) to access a menu of online courses and tools on a variety of public health topics. Click here to learn more about the LMS. Forums: (members-only) Engage with public health colleagues throughout the state by starting or joining ongoing conversations. Groups: Join groups to interact with members who share your interests, role, or location. Directory: (members-only) Find a list of other members of the online community and their contact information. You can also add Friends and join Groups. Events: Find upcoming public health events, webinars, trainings and conferences in Oklahoma and across the country. About: Find info about this site and who is eligible to become a member. Search: Click on the magnifying glass – circled in red below – to search the site by keyword or phrase. Type in the keyword(s) you would like to find. Click search and view the results. Quickly find what’s newest on the site with a glance at the homepage! Here’s a quick intro to what you’ll find. Featured: Look here first for newly-posted announcements or other important information. Use the arrow keys to see all the Featured items. Oklahoma Spotlight: People and programs doing exceptional work in Oklahoma communities are highlighted here. Tools, Research, Data & Stats: See the newest resources for each of these categories. 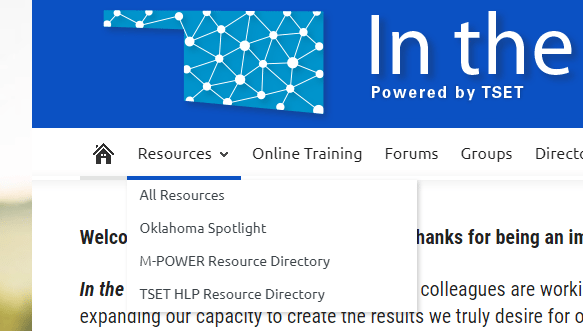 Use the arrows to see additional resources or click on the category name to see all the resources in that category, or browse all available resources on the Resources page (on the main navigation bar). 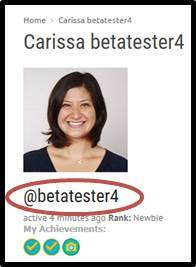 Who’s Online: See who else is online right now – hover over any avatar to see basic profile information. Recent Member Activity: See the most recent updates from community members. Click on the Recent Member Activity tab to reveal full list of member activity. Recent Forum Topics: See the most recent topics posted on the Forum. Click on any of the posts to go directly to the topic’s page to join the conversation. Achievements Leaderboard: See which community members have been the most active contributors on the site. My Achievements: See how you’ve contributed to the OK In the Know community. Using the dropdown menus and buttons at the top of the page, you can filter the list of resource posts by category (e.g. news, data, research), by the topics they are tagged with, or by date. You do not need to log in to view most of the resources on this site, so feel free to share them with your community partners. Some posts are password-protected and available only to OK In the Know members. 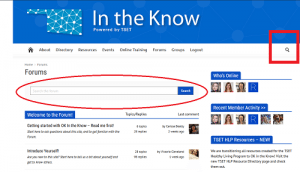 As a member of the In the Know community, you may join in the conversations on the Forums section of the site. If you’re curious about a particular health topic or wondering if anyone has experience with a wellness strategy, chances are you’re not the only one. We each know a little, and collectively, OK In the Know community members know a LOT! 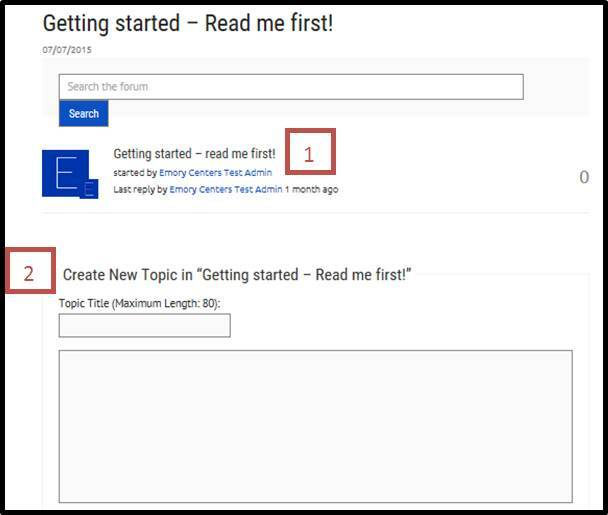 By posting your questions in the Forum, everyone can benefit and learn something new. Everyone has a unique perspective to share, so don’t forget to pay it forward and answer others’ questions too. Search: Find information others have shared by keyword or phrase. Type into the search bar (1). Click search and view the posts in the forum with the keyword(s) you entered. Getting started: Instructions for navigating the Forum. Introduce yourself: Consider this the Welcome Wagon! Introduce yourself to the community and see who else is new to the neighborhood. Categories: Under each main category for discussions in the Forum are discussion threads where you can post or reply. Welcome to the Forum: Find more information on how to use the forum, site announcements, and a place to introduce yourself to the rest of the community! Share: Post general announcements from your community or share tips, tools and success stories. Ask a Question: Post questions here related to various public health topics (i.e. Administration & management, priority populations, youth, etc…). Discussion Threads: Each public health topic has its own discussion thread (circled in green). Have a question about what healthy eating media campaigns are most successful for a particular population? Post a question in the “Media & Communication” Thread under the “Questions” heading. Want a sample tobacco-free policy from a healthcare agency? Ask for it under the “Policy/ coalition building” thread under the “Questions” heading. Looking to fill a vacant position in your organization? Post a job listing under the “General Announcements” thread under the “Share” heading. Want to share the amazing work you did? Tell us about it under the “Tips, Tools, and Success Stories” Thread under the “Share” heading. You can add to the conversation by creating a new topic or replying to an existing topic in one of the Forum’s many discussion threads. When you click on a discussion thread you will see the following screen. 1. Reply to a Topic: Keep conversations going by viewing and replying to topics submitted by other members – just click on the topic name to view. 2. Post New Topic: Start a new conversation by submitting a new topic in the appropriate discussion thread. Add topic tags and attachments to help get the conversation going. 3. Make sure others see your post: Mention other members in your posts using @ (i.e. @betatester4). Find each member’s usernames on their profile page. Mentions show in community member’s mention box and in Recent Member Activity. Subscribe: Click “subscribe” at the top of the post OR check the “notify me” box below a discussion to receive an email alert when someone adds to conversations on the topics you care about! You can turn this off later if the emails become too frequent. The directory is a great place to see who else is on the site. In the directory you can start making connections to others working in the same field or area of interest. You can find the directory on the main website navigation bar. When you arrive at the directory main page, you’ll see a list of all the other members of the site. You can use the search feature to find members by name, organization, job title, public health focus area, communities served, hometown, hobbies and more! Anything that could appear on a user’s profile can be found through the keyword search feature in the directory. For instance, if you are looking for individuals working in tobacco control in Tulsa, search using the keywords tobacco and Tulsa. All members whose profiles include the words tobacco and Tulsa will appear in your search results. The directory makes it super easy for you to make connections with other health professionals throughout the state. You can send friend requests in the directory. Just click on the “Add Friend” button that appears next to their name. 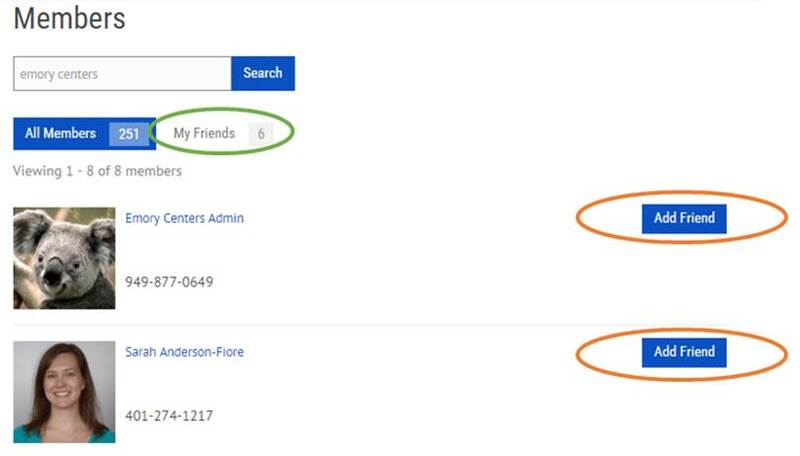 You can also view your current friends by clicking on “My Friends” within the directory. When you follow the link and are prompted to enter a new password, you may use the one that is automatically generated OR enter one you will remember. Your password for this site must be at least seven characters. It’s important to select a secure password, but also make sure it’s something you’ll remember. If you do not receive the “password reset” email or are still having trouble, contact our friendly community managers. Q: How can I post my events, resources, or materials to this site? Click here to learn how to post events, resources, and materials. There are two different ways to search the site to quickly and easily find what you’re looking for. 1) Click the magnifying glass in the top right corner of any page. 2) Type in the keyword(s) you would like to find (e.g. Certified Healthy or coalition building). 3) Click search and view the resources or events that match your search terms. Note: Searching the site does NOT bring up search results from the Forum – you must search the forum separately. 1) Go to the Forum section of the site (members only). 2) Type into the search bar that says “search the forum” (circled in red). 2) Click search and view the posts in the forum with the keyword(s) you entered. Q: Who is a part of OK In the Know? Health and wellness coalition members, community leaders, volunteers, and the public are encouraged to browse through the events and resources on OK In the Know to stay up-to-date on the latest information about focused efforts to prevent and reduce tobacco use, improve physical activity and nutrition, and prevent substance abuse. Q: Can I be a member of OK In the Know? In the beginning as we build and shape the OK In the Know community, membership is limited to the groups mentioned above. We’re starting small to learn how collaboration works for some key groups in Oklahoma, much like a pilot phase. In the near future, we hope to add new members, voices, and expertise from other groups that play an integral role in promoting health in the state of Oklahoma. No matter where you’re coming from, everyone can access the wellness events, training opportunities, and tools in the open-access areas of the site, so please do! If there is a particular group you think should be a part of the community, or if you have suggestions for what else you would like to see on the site, please contact us. We value your candid feedback and look forward to hearing from you! Q: I’m having problems with the LMS! What should I do? 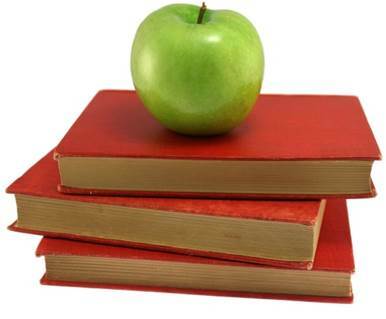 First, check out the how-to guide for the LMS and LMS FAQ here. If you’re still having problems, contact your LMS administrator. Q: What should I do if I have a question that isn’t answered here? See the “How Do I Get Help?” section. This site has an achievements system for members, through which we provide extra recognition to “good neighbors” who welcome newbies to the site, share their perspectives in the Forums, and take the time to help others. Click here to see the achievements you’ve earned so far, and to learn more about how you can be recognized for being a great collaborator (members only)! If you have a technical problem or question about the website, post it in the Forum here (members only) or contact us. Feel free to add to existing threads or create a new post. The Forum is organized by subject matter area, so you may find an existing answer to your question there. You can view the “Forum” section of this How-To Guide for more instructions. If all else fails, whether you’re looking for tech help or trying to connect with someone from the community, please contact us and our Community Team will be in touch. Click here to download this “How-To” guide.